Blood orange chocolate glazed donuts with cream cheese filling have all the deliciousness you expect from a filled donut but are baked instead of fried! Where to begin with these blood orange chocolate glazed donuts? Ohhhh where to even begin? With their cute pink butts? Their glossy chocolate top? Their (baked not fried!) little bodies? Sometimes, and I mean few and far between, you spend all day on a recipe that very well may not work out like the image you have swirling around in your head. But 8 hours later, it does and you feel like your insides are going to explode with pride. You want to scream out “OMFG they worked! It’s amazing! Taste THIS!” but no one is home and even if they were, they (because they’re of the male variety who consistently makes a pound of pasta in the smallest sauce pot you own even though you explain over and over again why a bigger pot is needed) wouldn’t get it. Like, at all. So you keep your excitement to yourself and then take it out on the internet instead. Internet, THESE DONUTS ARE FREAKIN’ AMAZING and everything I thought they would be when the idea to make a cream filled chocolate glazed donut but bake it instead of fry it came to me. The dough was dreamy from the start. Perfectly elastic, silky and rose like a champ. All good signs but the true test came when they got baked off in the oven. I wanted them soft enough on the inside to keep that ridiculously delicious moistness that a good cream filled donut has but obviously cook enough on the outside to keep the thing together. 8 minutes later…success. After that it was just about piping in a blood orange tinted cream cheese filling and dipping in chocolate. What could wrong with either of those things?! This is hands down my favorite recipe of Doughnut Week. No mess and stench from frying and no cop-out donut pan. Plus, chocolate, blood oranges and cream cheese. Unless you added booze, it’s hard to get better than those 3 things. 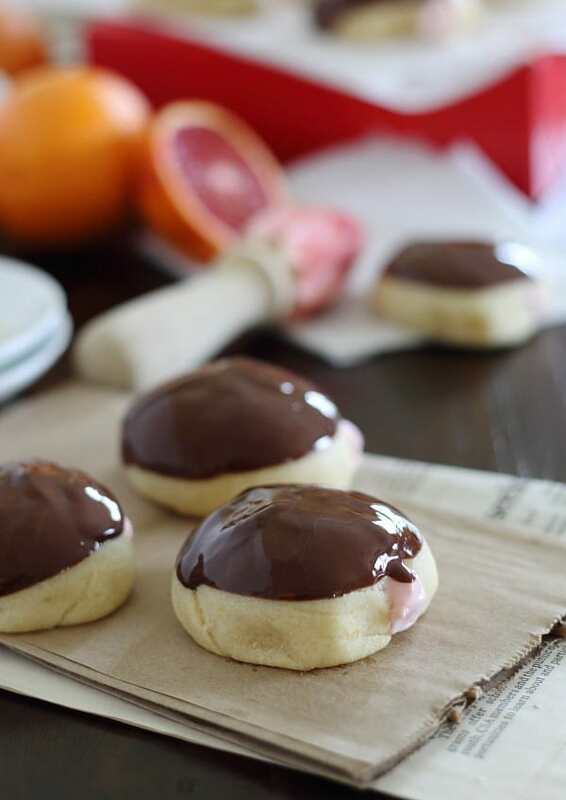 Love this blood orange cream cheese filled chocolate glazed donut recipe? Try these donut recipes too: Baked chocolate avocado cake donuts, Chocolate pumpkin donut holes with amaretto glaze and Chocolate Glazed Donut Bites. Blood orange cream cheese filled chocolate glazed donuts have all the deliciousness you expect from a filled donut but are baked instead of fried! In the bowl of a stand mixer, add the warmed milk, water, sugar and sprinkle the yeast on top. Gently stir and let bloom for 10 minutes. Once frothy, with the dough hook attachment, turn the mixer onto low speed. Add the flour, butter, salt, zest, extracts and blood orange juice and mix for about 5-7 minutes until the dough starts to pull away from the sides of the bowl. Add additional flour 1 tablespoon at a time if needed to get the dough to come together. Turn the dough out onto a flat surface, shape into a ball and transfer to an oiled bowl. Cover with a towel and let rise in a warm place until doubled in size, about an hour. Once risen, turn the dough out onto a floured surface, gently knead a few times and then roll out into a 1 inch thick circle. Using a biscuit cutter, cookie cutter or rim of a 2 inch wide glass, cut out circles of dough and place on a parchment paper or silpat lined baking sheet. Cover with a towel and let rise again for another 45 minutes-1 hour until doubled in size. Once risen, preheat oven to 375, fill a loaf pan 1/2 way with water and place in oven. If the dough spread while rising, tuck the side of the circles underneath to form more of a ball shape than a disk. You want them to be puffy enough to fill after baking. Bake for 4 minutes, turn the sheet and bake for another 3-4 minutes, removing them from the oven just as they start to turn brown on the top. Let the donuts cool on the sheet for a few minutes before transferring to a cooling rack. While the donuts cool, make the filling by beating the cream cheese with a hand held electric mixer for 1 minute. Add the powdered sugar and beat until incorporated. Lastly, add the blood orange juice and beat until a light pink color. Fill a pastry bag fitted with a long skinny tip with the cream cheese filling. Once donuts are cooled completely, insert the tip into the center of the donut from the side and gently squeeze the filling to fill the cavity of the donut, careful not to overfill. Melt the chocolate and coconut oil and dip the tops of the donuts. Place back on the cooling rack to let the chocolate set before serving. Pingback: Salted Peanut and Honey Doughnuts - Healthy. Delicious. I have actually never had a blood orange before, but I can’t think of a better way then to try them in a donut form! That cream cheese filling and the shiny chocolate glaze is killlllling me. I want all the donuts. NEED all the donuts. This is a total winner Gina! I dont even like oranges and I am drooling over these pics!!! These doughnuts are rocking! Youuuu sneaky woman you with the blood orange and chocolate combo. Thanks for making me drool all over my desk like a crazy person. I applaud you. My coworkers might think I’m nuts for licking my monitor but you and I both know why and that’s all that matters. So not to be creepy anymore, these. sound. RIDICULOUSLY. GOOD. That’s always fun when a recipe you try out for the first time ever, actually turns out well! Get out! 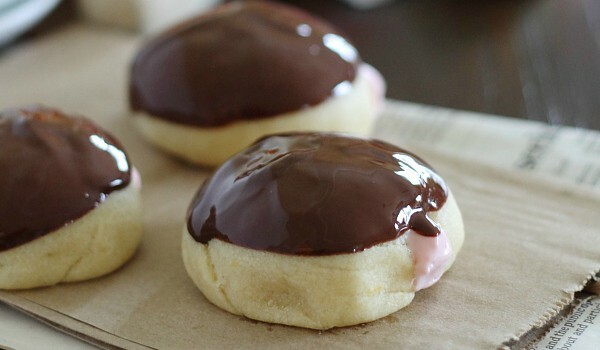 You can BAKE cream filled donuts? I had no idea. This is seriously life-changing, Gina. WOW!! I’m just blown away by all of you ladies’ creativeness. Unbelievable!! I am going to have to go on the hunt for some Blood Oranges now! Your donuts look delish! I love that they are baked and not fried. I am bookmarking this recipe, I must give it a try!! Looking so YUM. I just want this. oh my gawd, these are brilliant. . so delicious!!!! Ummm holy ISH!!! These lived up to every doughnut week dream!! I’m pretty excited for these donuts. Not only do they use blood oranges (my fav! ), they are baked. Oh my gosh, YUM! 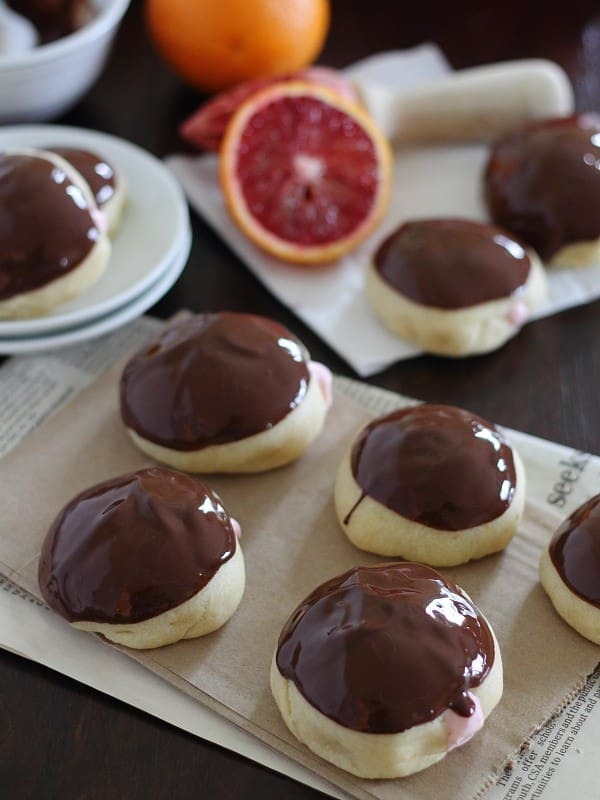 I would have never thought of the blood orange/cream cheese/ chocolate combination, but these look divine! where are the facebook links…what am i doing wrong…. Gina these donuts, the quinoa pancakes, and the puffed cereal….WOW. You are really rocking it! Pinned all of them and loving these recipes & your photography is breath-taking! Absolutely beautiful photos! I had to make them right away and they turned out amazing. I had to give most of them away so I wouldn’t sit there and eat them all myself. I made a few with a vanilla glaze for my husband (he doesn’t like chocolate) and he loved them too! These look and sound delicious! I love how it’s filled with cream cheese, which makes it sound even tastier. I could easily eat a dozen of these. 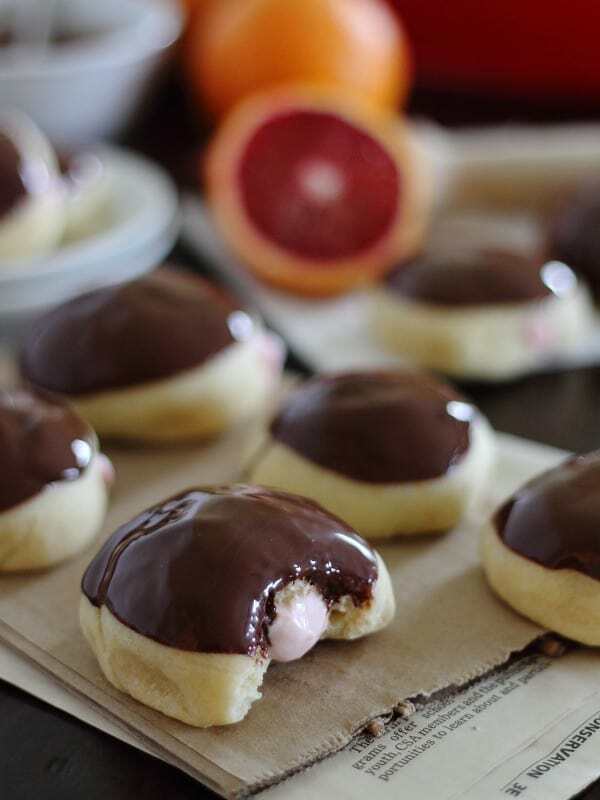 I’ve never tried my own filling and I’ve been wanting to… plus the combo of blood orange and chocolate is too much to resist. Can’t wait to give these a whirl! This recipe sounds great, cant wait to try it. But seriously, what is blood orange cream cheese & blood orange juice. Is it something I have to order online or can this be purchased in local grocery stores? It’s all explained in the recipe. No special ingredients, just the juice of a real blood orange.